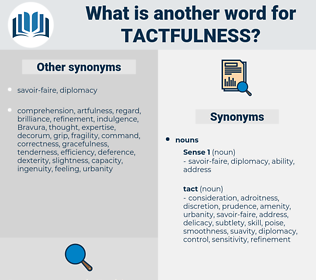 What is another word for tactfulness? ignorance, omission, agitation, bad manners, upset, stupidity, ineptness, negligence, inability, neglect, carelessness. 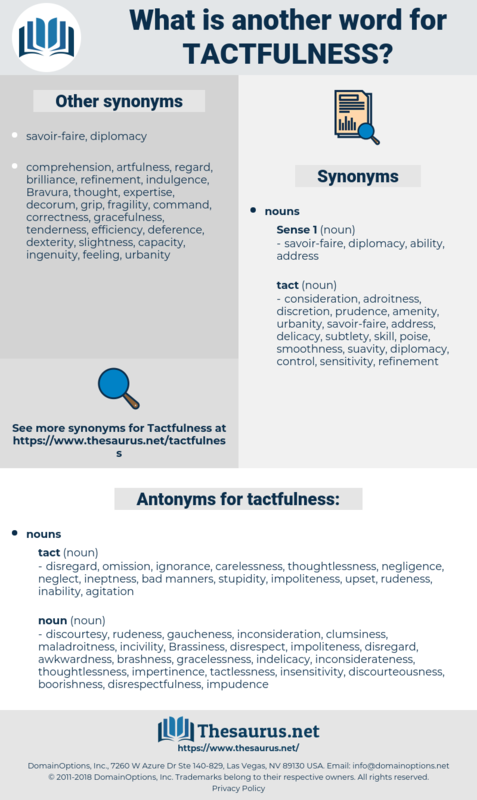 discourtesy, rudeness, gaucheness, inconsideration, clumsiness, maladroitness, incivility, Brassiness, disrespect, impoliteness, disregard, awkwardness, brashness, gracelessness, indelicacy, inconsiderateness, thoughtlessness, impertinence, tactlessness, insensitivity, discourteousness, boorishness, disrespectfulness, impudence, ungraciousness, insolence. At any rate she surmised the real reason of my prompt visit to them, and when supper was over, came to my help with something of my own mother's tactfulness. But the more I realized this, the more I determined to do all I could for her, and as to do this, I must gain her confidence, and even liking, I resolved to approach the subject the next day with the utmost tactfulness and kindliness, hoping by this means to induce the truth from her.